← 435 "Wedding for Disaster"
"Who'd've thought that such a little woman could make me feel so big." The family are a series of animation cels. Homer is naked until Marge pulls down one last cel which clothes him. "Eeny Teeny Maya, Moe" is the sixteenth episode of season 20. It originally aired on April 5, 2009. The episode was written by John Frink and directed by Nancy Kruse. "Moe develops an Internet relationship with a beautiful woman named Maya. When the two agree to meet face to face, Moe is shocked to discover that Maya is three feet tall. Meanwhile, Marge wants Homer to spend more time with Maggie. Homer obliges and finds himself in luck when he discovers a day care right next to Moe's Tavern." Homer attempts to spend more time with Maggie and ends up bringing her to Moe's Tavern. Moe is cleaning up the bar for a date, and finds out he actually has a window, which was previously obscured by layers of grime. Outside the window is a playground, which Homer sees as an opportunity for watching Maggie while spending time at Moe's. Homer sends Maggie to play with the other babies outside, but they torment her for unknown reasons. Marge notices Maggie is uncomfortable when she returns home one day, and becomes worried that Homer is neglecting her. After watching a commercial about a surveillance camera fixed in the eye of a teddy bear, Marge purchases a spy camera which she attaches to Maggie's hair band and discovers that Maggie is bullied by a group of gangster babies. At first, Marge is surprised to see Maggie being tormented by the babies, but sees Homer rush to Maggie's rescue and be beaten up by Kearney's son. Maggie jumps to Homer's rescue and Homer says that he loves both her and Marge. Moved to tears, Marge tells Homer he is a wonderful father. Meanwhile, Moe's date named Maya, whom he met over the internet, turns out to be three feet tall. Moe still loves her, but is worried about what his friends will think. Moe decides to take Maya on a double date with Marge and Homer, neither of whom seem to care that she is small. Homer, seeing Maya's intelligence and sensitivity, suggests Moe marry her. Moe proposes but cannot resist making jokes about Maya's height. Insulted, she rejects him. Crushed by grief, Moe consults the advice of Lenny and Carl, who advise him to do something risky to win Maya back. Moe decides to have surgery to become shorter, and Dr. Nick Riviera agrees to conduct the surgery. Maya stops Moe just before the surgery, as she wants someone who sees her as "beautiful" not "short", and who doesn't need to cut himself down to her size in order to love her. Moe, intent on having the surgery, does not take heed of Maya, and she leaves him. Homer tells Moe to remember that if someone loved him once, someone can love him again. 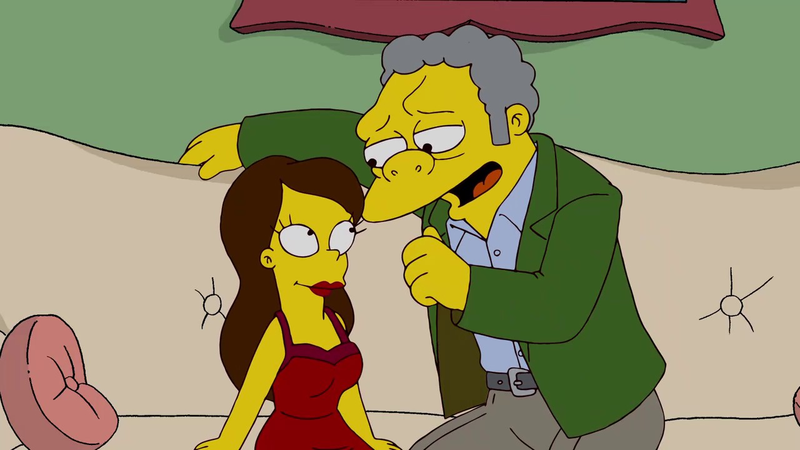 As the episode ends, Moe wonders how a woman so short could make him feel so big. The episode has received mostly positive reviews from television critics since its airing. A reviewer of IGN.com gave the episode a 7.6/10 and said when Homer consoled Moe about Maya breaking up with him, it was "a sweet way to end this enjoyable episode". Erich Asperschlager of TV Verdict wrote: "Spending too much time away from the family has always been tricky for The Simpsons. Letting minor characters shine can be fun, but let’s face it: people tune in to watch the Simpsons, not the Szyslaks, or the Flanderses, or the Leonard-Carlsons. Then again, spending too much time with the family can be exhausting. This week, The Simpsons hit a nice middle ground, spending most of the episode on Moe’s short-lived relationship but backing it up with a Homer-Maggie-Marge B-plot. Neither story soared to great heights, but 'Eeny Teeny Maya Moe' was a solid entry in a (thus far) solid season." ↑ Canning, Robert. The Simpsons: "Eeny Teeny Maya Moe" Review. IGN. Retrieved on 2009-04-08. ↑ The Simpsons 20.16: "Eeny Teeny Maya Moe". Tvverdict.com. Retrieved on 2009-04-08. Modified on August 10, 2017, at 07:46.